How is everyone doing? I feel like this summer is just flying by. It's hard to believe were already nearing the end of another week! 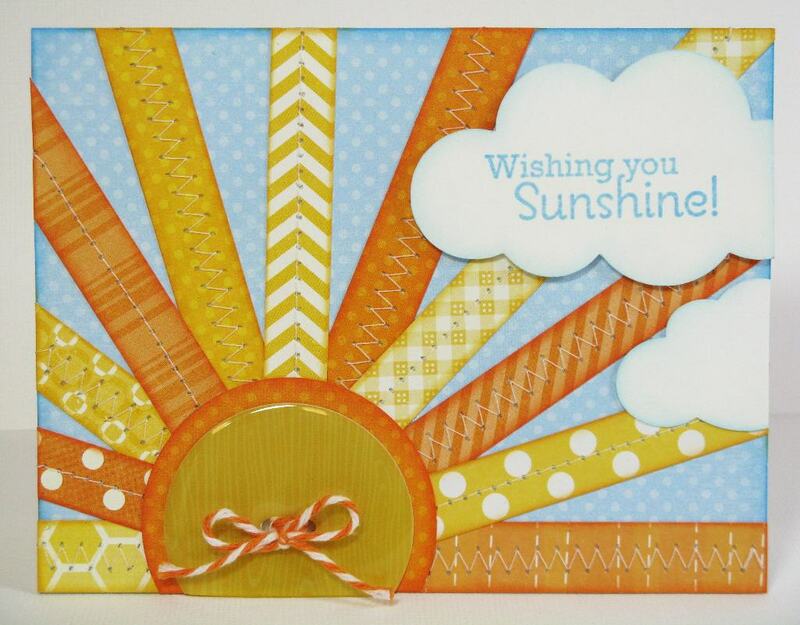 I thought before summer passes me by I would share a couple of summery cards I made awhile back. My first one uses an epoxy button by Jillibean Soup and lots of scraps of paper from various echo park collections. My sentiment is from Papertrey Ink's Scattered Showers stamp set and the clouds were cut on my Silhouette. Well, that about wraps it up. I hope you guys enjoy your weekend! Hello sweet friend! Such cuteness on here today! Love both cards :) Thanks for stopping by my blog the other day and leaving me some love, my summer is going great but I'm ready for the fall :) hope yours is going great too! These are adorable Mendi! I especially love the sunburst one!! It's just so happy!! These cards are just gorgeous! I love the sunburst one so much... that seems to be the one pattern that catches my eye each time.